We started home winemaking many years ago but then found ourselves too busy to devote much time to it. When we came to clear out at my mothers wine cellar at Bath we found a number of full demijohns and on checking there were even more under our own stairs. Trying some of our wines which were up to twenty years old quickly convinced us we should start again! We have always found that fruit wines come out best and will keep for years, especially if left in the demi-johns. We have made wines from kits/grape concentrate but results have been disappointing and the wines start downhill after a year or so. Wines made from Blackberries, Elderberries and even Raspberries keep much longer and we opened our last bottle of 30 year old Elderberry to see in the New Year of 2007 which was still in its prime. White wine never keeps as long - or need as long to mature. We used to regularly made a light dry white from Gooseberries which is drinkable in a year and could pass for a grape wine after two - it is ideal for Mussels. We have also found some older Gooseberry which was much fuller bodied, slightly sweeter and tasting much more of the fruit. It was still slightly petulant and was something we wanted to try to repeat - we should have kept better records! See 2000 and 2001 for progress. Several people have asked me how we make our wines so I started this page by firstly putting together some advice and tips - they assume you have perhaps made a kit wine and at least understand the basic terms. It has been gradually augmented by the recipes and specific techniques we have developed as time has gone on. The methods employed have however become increasingly standardised as time has gone so if you want to make a wine we have not covered then have a look at the Standard Method Mixed Fruit Wine for ideas. I have also added a supporting page with some relevant technical background and useful facts to help one make a wine of the strength and final specific gravity (sweetness) one wants. Since restarting making wine we have been producing about 4 batches a year, 3 of them being favourites such as Gooseberry, Blackberry and Morello Cherry with a trial batch of something different such as Elderflower, Loganberry, Plum, Mixed fruit, Blackcurrant or our specialty Stoneberry from a mix of stoned fruit and berries. We try to keep them for at least 3 years to mature before bottling and drinking. Make sensible amounts: 4 gallons takes less than double the time that one gallon takes as all the time is spent in cleaning, sterilising etc the equipment before and after each stage. Two 4 gallon batches a year gives a bottle a week for a year. Clean and sterilise everything: We use Chempro SDP or a similar cleaner for glassware etc as well as a final rinse with a Sodium Metabisulphite solution. Freeze the fruit: Probably the best tip we can give is freeze and thaw the fruit at least once - several times is even better. It breaks down the cells allowing the flavour to be extracted by the yeast. It also allows one to collect enough together for a sensible batch and to be able to blend. Sterilise the fruit: It is a waste of time cleaning everything if you use dirty mouldy fruit. I rinse the fruit in a Sodium Metabisulphite solution of two campden tablets in 2 litres water as it is finishing thawing (leaving it on the fruit for a couple of minutes) and drain off. I then let it stand with the residual Sodium Metabisulphite until thawed. This also reduces oxidation. Crush the fruit: I hand crush soft fruit and remove what stones I can whilst it is still in the remains of the Sodium Metabisulphite. With Plums I also remove some of the skins to avoid a harshness/metallic taste. Apples, Sultanas and Raisins go in a blender. Do not leave the fruit standing around: Any fruit will eventually oxidise (go brown) after it is crushed, especially unripe fruit, until it is protected by liquid and eventually the Carbon Dioxide blanket and alcohol from fermentation. Boil the sugar: I boil in a small amount of water for three minutes to invert it and sterilise it. I then pour over the fruit to disperse any Sulphur Dioxide and finish off any remaining wild yeast etc. Choose how hot you get the fruit: Too much boiling liquid will end up partly cooking the fruit which extracts extra flavour but gives a more boiled fruit taste. It also extracts pectin which will make the wine cloudy. Add pectic enzyme: Add it when the fruit has cooled and leave for a few hours before adding the yeast if there is a risk of pectin. Plums, apples and gooseberries can be problems if you get them too hot. Blackberries are supposed to be a problem but we have not suffered. Use a starter bottle: I mix up a little yeast with an equal amount of sugar in warm (having been boiled) water. When it is fermenting I add an equal volume of the must. I usually divide and add must a couple more times until I have a couple of wine bottles full of fermenting solution ready to add to the must when it has cooled and/or the pectozyme has done it's thing. Ferment on the fruit: I try to make 4 gallons at a time in 5 gallon beer making tub which has a lid. This gives plenty of space for the fruit to float up to the surface in the froth of yeast without overflowing. This pulp should be pressed against the side and pushed down once or twice a day. In between it is covered over with the lid and protected by the blanket of CO2. Do not ferment on Elderberries: They are full of tannin so remove all the stalks and boil them in water until the skins dimple - then strain quickly. Ferment with grape juice (half that when used alone) or raisons to give some extra body - excellent and drinkable within a few years. Ferment on the fruit at your peril - the insides of the bottles get plated with a black layer you can not see through and it needs ten or more years to even become tolerable. Blend Elderberries: Better still mix some into other fruit wines to give flavour and colour. Mixed Fruit wines: Blends can often be better than there components and come closest to Grape wines in flavour if that is what you want. Our Stoneberry is a good example of a blend. Increasing the Body Add Raisins, Sultanas or even good quality grape concentrate for more body. A single banana adds a lot of body to a wine such as plum without a significant taste or bouquet of banana. Add the sugar in stages: Use 2 to 2.5 kilos sugar for the initial fermentation on the fruit then add another 1.5 to 2 kilos (boiled and cooled) after straining off the pulp (assuming 4 demijohns/20 litres are being made). Leave some head room to add more sugar solution and to prevent it frothing out through the fermentation traps. Put sterilising solution in the traps: and also put a piece of cotton wool or even tissue in the top to avoid flies getting into the trap. Watch the specific gravity: Every time the Specific gravity drops below 1.000 boil 400 grams of sugar in enough water to give about 500 mls solution, cool, divide between the 4 jars and swirl well. It is best to extract some wine and mix before pouring back so it does not sink to the bottom or swirl the jars before adding. Stop adding sugar when you have added enough to reach close to the alcohol level you require and/or the fermentation slows right down. 100 grams sugar per demijohn gives 1% alcohol and assume about there is about 100 grams extra from the fruit you use. Rack as soon as the fermentation has slowed down: and you have added all the sugar you need (other than a little sugar syrup to compensate for the lost volume in racking) - now is also the time to reduce the air gap. Place the demijohns on a wedge when racking: this enables one to get the siphon tube to the bottom without disturbing the sediment - raising the side by about an inch is sufficient without too much risk of it slipping. Non slip mats are ideal with a piece of wood about 3/4 inch thick. Use a tap on the end of the symphony tube: Wine shops sell little taps which enable one to slow down the flow at the end when you are close to the sediment and stop so you can transfer to the next demijohn with a full tube to save time. Keep records: It is easy to forget how much sugar you have added and given time how the wine was made and when it was started. Tag all the jars in the batch - winemaking shops produce reusable plastic tags which clip on. Do not hurry: Most red fruit wines will take two or three years. The first year can be under a fermentation trap and racked if you see sediment followed by a year or two more in the demijohn maturing with a cork bung. You do not need to kill it with sterilising tablets if you take it slow. Do not bottle too early: Homemade wine keeps and matures well in bulk. Keep in Demijohns in a cool dark place with a cork bung to allow it to breath a little and mature. Some of ours stayed forgotten like that for over ten years. When you bottle late plastic corks are fine and the wine can be stored upright. Many of the best vineyards are changing to screw tops to avoid tainted wines. Clean bottles immediately for reuse: We rinse the bottles a couple of times and then add a Campden tablet to an inch of water and replace the plastic cork. Labels are attached with a water based kiddy adhesive so the bottles are immediately ready for refilling. It is really too early to call this a favourite wine as it is the first time we have made it. Lots of people have however asked why we never make it as it is one of the classic flower wines. Whilst we were returning home down the Kennet and Avon in mid June the trees were laden with blooms at every stage of maturity so we decided we would have a go. We picked and trimmed the last day away and kept the florets in the fridge loosely packed ready to start the next morning. In retrospect it would probably have been better not to delay and to have poured boiling water over immediately and then have store the cooled juice with a campden tablet added. Our method follows. Picked about 50 heads of Elderflowers in the sun and well open. Selected nice clean open florets and cut them off with scissors. Peeled rind from 5 lemons (take care to avoid the pith) and chopped up coarsely. Put Elderflowers in 2 gallon bucket with lemon peel and poured on 6 pints boiling water. Left for 18 more hours and add starter bottle of yeast. Two teaspoons used of CWE Formula 67 yeast which contains nutrients which are very important for flower wines. Added another 500 gms sugar (boiled with 500 ccs water and cooled to 35 degrees) giving total so far of 2 Kgs. Topped up demijohns to 3 cms from the top with boiled and cooled water and inserted fermentation traps - fermenting very fast! Added another 250 gms sugar (boiled with 0.5 litre water and cooled to 35 degrees) after two more days giving total so far of 2.25 Kgs between the 2 demijohns. With the sugar from the Raisins and Sultanas this should give a dry wine of about 12.5%. Added 2 teaspoons of grape tannin dissolved in 500 ccs of warm water. This could have been added at the start of the fermentation but we did not have any available. Bottled first gallon after 2.5 years Tried half bottle after 3 years - yellow tint and very flowery, we could use less elderflowers, but overall much better than we had expected. It is worth noting that there are many different species of elder from those with a very delicate bouquet through to those with a really pungent cat pee smell so it is worth trying a number of sources and selecting from those trees with the best bouquet. See below for alternative of using Thorncroft Elderflower Cordial if you want to add some of the bouquet to other wines at a time when fresh elderflowers are not available. We are currently trying a couple of Elderflower blends, firstly 4 demijohns of a light Gooseberry and Elderflower wine which I hope will bring out the best of both - the picking season may just overlap enough in late June but this time I am using frozen gooseberries from the previous year. The second blend is a 2 demijohn batch of Victoria Plum and Elderflower which I hope will give a light rosé with the tannin from the plums complementing the bouquet from the elderflowers made with frozen plums from last season. The elderflowers were picked on the canals, prepared as above but immediately covered in boiling water and left to infuse for a day with a campden tablet added before storage in bottles with an additional campden tablet in each bottle. More details will follow as we progress. 3 x 4 litre tubs of frozen gooseberries from our own bushes, not topped and tailed but washed in sodium met solution and hand crushed. 2 Kilos Sugar boiled and added to the fruit and made up to 3.5 gallons with boiling water - probably hot enough to be sterilising. A bottle of elderflower infusion containing the equivalent of 1 litre of lightly pressed florets added. Cooled and 24 gms of Young's pectic enzyme and 2 campden tablets added. After 24 hours a starter bottle of CWE Formula 67 yeast added - we tend to add half the bottle and top it up with the juice and repeat a couple of times until the main container is visibly fermenting if we have used campden tablets. Strained after 4 days fermenting on pulp into 4 demijohns and 1.0 Kg Sugar in solution added. After another couple of days the fermentation was slowing and gravity down to 1.005 so another 1.0 Kgs Sugar in solution added which reached our target of a total of 1.25 kgs per demijohn for a 12.5% wine. Racked after a year - clear, proper colour of pale yellow so a campden tablet added and sealed. 2 x 4 litre tubs of frozen Victoria Plums from our own tree,washed in sodium met solution, stoned and mostly skinned when they came off the frozen plums easily and hand crushed. 1 Kilos Sugar boiled and added to the fruit and made up to 1.5 gallons with boiling water - probably hot enough to be sterilising. A half bottle of elderflower infusion containing the equivalent of 0.5 litre of lightly pressed florets added. Cooled and 12 gms of Young's pectic enzyme and 2 campden tablets added. After 16 hours a starter bottle of CWE Formula 67 yeast added - we tend to add half the bottle and top it up with the juice and repeat a couple of times until the main container is visibly fermenting. Strained after 4 days fermenting on pulp into 2 demijohns and 0.5 Kg Sugar in solution added. After another couple of days the fermentation another 0.5 Kgs Sugar in solution. Racked when fermentation stopped at same time as above but not so clear. Racked after a year - still very murky and possibly still fermenting as gravities 1.020 and 1.005. A nice pale pink colour and taste promising. The two demijohns were mixed equally to get to the same medium wine and a campden tablet added and left with fermentation traps in demijohns to hopefully clear a little. The Elderflower and Gooseberry blend above was turning out very well by 2008 but we were away during the elderflower season so we have tried adding Thorncroft Elderflower Cordial which we found first in Culpepper - it is organic and without additives - one 375ml bottle was added to two demijohns out of a 4 gallon batch of gooseberry as an experiment. The one with the Elderflower cordial cleared quicker and has a light taste and bouquet of elderflower which is less pronounced than when we used our own infusion. 4 x 4 litre tubs of frozen gooseberries from our own bushes, topped and tailed and washed in sodium met solution and hand crushed. After 24 hours a starter bottle of with 30 gms of Young's Super Wine Yeast Compound was added - we tend to add half the bottle and top it up with the juice and repeat a couple of times until the main container is visibly fermenting if we have used campden tablets. A bottle of elderflower cordial from Culpepper containing approximately 20 gms Elderflower petals and 300 gms sugar was added to two demijohns and the matching amount of sugar solution to the other two. This reached our target of a total of 1.35 kgs sugar per demijohn for a 14.5% wine. Racked when fermentation stopped and clearing nicely after a couple of months with the demijohns with the Elderflower clearing faster. We picked a large number of elderflower heads from a selection of bushes at the George Billington Lock on the River Avon, the one that runs through Stratford. The intention was to make a very intense Elderflower Wine to blend with other wines. The 70 or so heads we picked gave us 4 litres of florets measured when shaken down rather than compressed. We added boiling water to just cover them and steeped for 24 hours before sieving and adding a campden tablet to preserve it. 2.8 litres of florets equivalent of extract was used to make the wine base and remaining 1.2 litres of florets was used for our first attempts at a Elderflower cordial. For the wine base we added the finely chopped zest and juice of 5 lemons and 250 grams of well chopped sultanas. We dissolved 500 gms of sugar in water and boiled for 5 minutes before adding the sultanas and lemon zest. We added the elderflower extract, 20gms of citric acid and then 5 gms of pectic enzyme once it had cooled. Everything was poured into a demijohn as we were on the boat and had not got our usual bucket. Left for 24 hours and a starter bottle of yeast started and progressively divided before adding to the wine. After 5 days it was filtered through a course sieve as we had no bag for straining with us and returned to the demijohn and another 600 grams of sugar added as fermentation had slowed to almost nothing. This is a standard 4 demijohn batch of Gooseberry blended with our concentrated Elderflower base from the George Billington Lock to make 5 demijohns of the Elderflower and Gooseberry. We added 2 litres of the elderflower 'base' which was equivalent of 1.3 litres of florets and 500 gms of sugar equivalent with the intention of duplicating the balance of the 2006. 2 Kilos Sugar boiled and added to the fruit and made up to 4 gallons with boiling water - probably hot enough to be sterilising. Cooled and 16 gms of Young's pectic enzyme and 2 campden tablets added. Strained after 5 days fermenting on pulp into 5 demijohns and the concentrated Elderflower base and 1.0 Kg Sugar in solution added. After another couple of days the fermentation was slowing and gravity down to 1.005 so another 1 Kgs Sugar in solution added . We used the remainder of our extract from above which was 750 cc and contained the equivalent of 1.2 litres of florets. We added 25 grams citric acid, the 5 chopped lemons left over and 1.5 kgms sugar. It was brought up to the boil and allowed to cool producing 1.6 litres of cordial which was stored in sterilised wine bottles in the fridge. Overall slightly sweet at an appropriate dilution for the elderflower taste. The Elderflower steeped lemons saved and added to sweets - almost like a jam in texture when cool - nothing goes to waste. We picked 50 florets of various sizes from a selection of bushes round the basin at Llangollen on 29th May and cut off the smaller florets - total volume when lightly pressed down and allowed to spring back was 3 litres. Care was taken that all flowers open but non were losing petals or brown. 1.5 kgs of sugar and 1.2 litres water was brought to the boil and 4 small unwaxed lemons added with the zest peeled off and roughly chopped and the remainder sliced. Also 50 gms of citric acid. After boiling for 5 mins until the lemons were soft the elderflowers were added and pushed down using the next level of the steamer and left to cool with a lid and cloth over the top to protect from flies. After 2 days this was coarsely strained off - we only had the sieve in the steamer. The juice was out into sterilised wine bottles and we got 2.5 bottles. We added half a campden tablet to the whole bottles which we planned to use for winemaking. The lemons and peel were separated from the florets and the florets rinsed with a few hundred grams of water and added to the lemons with 400 grams of sugar and boiled and gradually reduced on the stove to produce a 'marmalade' - nothing goes to waste. We put it into two sterilised and warmed over the stove jars and it set very well. We are aiming for a dry wine without any stewed fruit taste. This type of gooseberry is like an Entre deux Mers and ideal for Moules. We therefore did not use boiling water but depended on freezing and thawing, a longer fermentation and pectic enzyme for the extraction. The fruit was soaked in sodium metabisulphite solution for ten minutes (teaspoon per Modules) and then top and tailed as soon as each batch was picked in the garden. The batches were then frozen until the wine was made in early July. They were crushed by hand to break open each berry as they were added to the fermenting bin - a long job for 8 Kgrams. The detailed description covers the 1999 batch with differences indicated. 4 x 4 litre ice cream tubs (8 kgs) of frozen gooseberries from our own bushes hand crushed. Boots Pectolitic Enzyme added with 2 campden tablets. 1 Kilo Sugar in solution added. Racked after 10 weeks - very clear with bubbles rising slowly from the lees and glinting in the sun and so dry at a gravity of .990 it makes me wonder if I have double booked some of the sugar! Topped using sugar solution containing .4 kilo sugar (giving total of 1.5 kgs/demijohn). The description following was repeated in 2001, 2002, 2003 and 2004 and scaled up in 2005 before returning to 4 demijohns in 2006. We are aiming for a medium dry wine with a more obvious Gooseberry taste - this is a wine which we have made several times before and does not need to be bone dry. We extract more of the Gooseberry flavour by using boiling water as well as freezing and thawing, a long fermentation and pectic enzyme. This year the fruit was frozen before toping and tailing because we were about to go away and some of the fruit was less ripe than I would have liked. Gooseberries can be cooked when under ripe, in fact they are best like that as the skins harden as they ripen. I prefer to wait until the seeds are definitely turning brown for winemaking. The batches were then frozen until the wine was made in mid July. The fruit was soaked in sodium metabisulphite solution for ten minutes (one teaspoon or a couple of campden tablets per tub) when almost thawed and then each berry was toped, tailed and crushed by hand to break open each berry as they were added to the fermenting bin - a long job for 8 Kgrams. We usually have trouble clearing Gooseberry made using a hot extraction so we use extra pectic enzyme and leave it longer than usual before adding the yeast. This seems to work as 6 weeks from start the 2000 wine was very clear with a very firm sediment and quite drinkable already when racking! The 2001 had an extra .5 kg fruit and .3 kg sugar and has been very slightly slower to clear although the gravity was .995 (Note - a calibration error was discovered on our hydrometer and this was probably more like 1.005). It looks as if the extra time with Pectic Enzyme works well and at long last we have the possibility of crystal clear gooseberry wine. In 2002 we made a 5 demijohn batch with 1.4 kgs added sugar per demijohn. Boots no longer do winemaking supplies and we now use 4-5 grams of Young's Cellarman Pectolase enzyme per demijohn (available from Wilkinson's hardware stores in 17 gm tubs). The fruit used in 2003 was quite green and we will aim for a drier more acidic wine to make sparkling or to drink with a meal - it finally had 1.35kgs added sugar per demijohn and a gravity of 1.000 when sealed. The fruit was a mixture of green and ripe in 2004 and we made a 5 gallon batch using 4.5 tubs of fruit. 8 kgs of frozen gooseberries from our own bushes, topped, tailed and hand crushed. 2.5 Kilos Sugar boiled and added to the fruit and made up to 4.5 gallons with boiling water - probably hot enough to be sterilising. After 36 hours a starter bottle of CWE Formula 67 yeast added - we tend to add half the bottle and top it up with the juice and repeat a couple of times until the main container is visibly fermenting if we have used campden tablets. Strained after 6 days fermenting on pulp into 4 demijohns and 0.75 Kilo Sugar in solution added. After 2 days fermentation was slowing and gravity down to 1.005 so another 0.75 Kilo Sugar in solution added. 6 weeks from start the wine was very clear with a firm sediment and fermentation seemed to have stopped so racked off lees. 1999 was the first time we have had enough Loganberries to make wine and we decided to aim for a dry and fairly light wine - say 12.5% alcohol. The books say you do not need a very large amount of Loganberries so we went for one kilo per demijohn - much less than we use for Blackberry. The fermented out cleared remarkably quickly and was crystal clear when we racked it off the lees after 10 weeks. The sediment was almost solid - the CWE yeast mixture contains both nutrient and some bentonite which is a clay type finning agent. The 2005 has been made with slightly more fruit (1.1 kgs/demijohn) and was aimed at a 14.5% alcohol. The following is the 1999 method. 1 Kgms Sugar boiled and added to the fruit and made up to 1.5 gallons. Cooled, pectic enzyme and 2 campden tablets added. Strained after 7 days on pulp into 2 demijohns with another .5 Kgs Sugar in solution. 3 batches sugar (0.5 + 0.3 +0.2 kgrams) added at intervals over a month as gravity fell. Racked off the lees (a solid sediment under crystal clear wine) 10 weeks after starting. Demijohns topped up with a sugar solution as it measured 0.995 and tasted almost too dry (another 0.2 kgrms sugar) . This is now about 1.35 kgrms sugar in 5 litres corresponding to about 14.5% alcohol - a little higher than we had intended. Results have been excellent with plenty of taste and it is a special occasions wine for us. We do not have many Blackcurrant bushes in the garden so this was first made using some new and some fruit frozen from a previous year. We used a 4 and a 3 litre tub and aimed for a tasty wine at about 13.5% wine. It fermented out quickly and was quite clear when we racked it off the lees after 6 weeks and crystal clear at the second racking a year later with very little extra sediment although it continued to ferment for as couple of years. On tasting we noted that next time we should possibly use less Blackcurrants as it was extremely tasty. We therefore made a batch the following year with the quantities reduced to 4.4 Kgs Blackcurrants (two tubs) for three demijohns but the same basic method but returned to the original quantities in 2002, 2003 and 2004 but aiming for a higher gravity and slightly sweeter wine. 3.8 Kgrams (7 litres)frozen Blackcurrants thawed overnight and warmed to room temperature in the microwave. 1.5 Kgms Sugar boiled and added to the fruit and made up to 1.6 gallons (sg 1.120). Cooled, 20 gms pectic enzyme and 2 campden tablets added. Strained after 6 days on pulp into 2 demijohns with another .8 Kgs Sugar in solution taking back to 1.065 specific gravity. 1 extra batch of sugar (0.2 kgrams) when the demijohns were topped up. Racked off the lees (a solid sediment under clear wine) 6 weeks after starting. Racked again after another year - crystal clear with a very small sediment. Very strong varietal taste and still slightly petulant and just off dry so left under a fermentation trap a little longer. In fact it one demijohn restarted in the spring 2 years after we started it! On tasting we found that it was extremely tasty and decided that next time we should use less Blackcurrants (say 1 - 1.5 kgs per demijohn) as and the quantities we used the first time seemed more appropriate to a rich sweet "port" wine with some raisins or bananas added to increase the body. Plum is a wine which is difficult to get exactly right. Plum alone is very short in body and has a slight tang if you make up by using more fruit. The best stoned fruit are old fashioned Damsons if you can get them and Morello Cherry is of course a favourite of ours. The accepted logic with Plum is to add Sultanas or Wheat to Plums to get more body. We have not fancied wheat but have made a few gallons of plum (from a friends farm) with sultanas. This turned out a wine which still seemed to lack something for drinking by itself, but made a perfect base for a punch where the taste and tannin from the skins complemented the cider, fruit, fruit juice and ginger wine we added. A huge amount went at our Silver Anniversary party and virtually nobody drank wine (other than some home made!). We have also recently been impressed with the results of a small batch (one demijohn) of what I have called Plum+ which is very drinkable. It was started before we initiated this web page so I have less documentation than these days - the bits in  were not documented but are my standard practice. The important points are that we used Victoria Plums (from our own tree) and added sultanas and a single ripe banana for body. The sloes were looking for a home and were used to add a little extra taste and colour. We intend to repeat and refine this recipe again using our Victoria Plums and perhaps adding 5-10% Morello cherries as well as, or instead of the sloes/bullaces (if not available), sultanas, and a banana. 1.5 lbs frozen Victoria Plums thawed and stoned (weight when stoned?). 1 ripe Banana (which gives body without excessive taste). [Cooled, pectic enzyme and 1 campden tablets added.] Plum is high in Pectin so pectic enzyme is essential if boiling water is added. Strained [after 5/6 days on pulp] into 1 demijohn with another 6 oz Sugar in solution added. Racked off the lees about 8 weeks after starting. Racked again after 2 years and sealed for storage. Already crystal clear and drinkable. 6 years from starting it is a very acceptable and well balanced fairly light wine. By now one needs considerable imagination to know there was banana present. The small number of elderberries in 1998 gave extra colour and a slight bouquet and taste of elderberry whilst the amounts were increased in 2004 to give a more obvious taste of Elderberry - the 2004 tasted very good at its final racking. 3 Kilos Sugar boiled and added to the fruit and made up to 4 gallons with boiling water. 3 x 0.5 kilo sugar added at 3-7 day intervals when gravity fell below 0.998. No sign of extra fermentation when summer came and very clear so racked off the lees and the fermentation traps replaced by corks. One campden tablet added to stabilise the wine as it is medium dry (1.005). Almost drinkable (after 8 months) but we will leave it in the demijohns in a cool place for another year at least before bottling. 700 g Elderberries (boiled and strained) for colour and a bit of Tannin. 2.5 Kilos Sugar boiled and added to the fruit and made up to 4 gallons with boiling water. 1 Kilo Sugar in solution added. and more in stages to a total of 6 kgs so quite light in alcohol at 13%. This was made predominantly with this years Blackberries from our own garden and frozen then slowly thawed to break down the fruit. 3 Kilos Sugar boiled and added to the fruit and made up to 4 gallons with boiling water - probably hot enough to be sterilised this time. Cooled and 8 campden tablets and pectic enzyme added as the fruit had been heated. After 16 hours a starter bottle of CWE Formula 67 yeast added - we tend to add half the bottle and top it up with the juice and repeat a couple of times until the main container is visibly fermenting if we have used campden tablets. Strained after 6 days on pulp into 4 demijohns - the 7 kilos fruit had reduced down to under 1.5 kilos dry pulp. 1 Kilo Sugar in solution added - gravity 1.060 and a very vigorous fermentation almost reaching the trap. Racked after another 6 weeks at 0.995 and clear. The wine was topped up with a boiled and cooled solution containing 400gms of sugar (total sugar 1.25 kgs/demijohn) and left to hopefully ferment a little more. This was first made predominantly in 2000 with Blackberries from our own garden and from Jo and Adrian's farm, frozen then slowly thawed to break down the fruit. I started with the intention of making a five demijohn batch but decided to make it a bit richer so strained into 4 demijohns. It was so promising that the recipe here was repeated almost exactly in 2001 except we used less campden tablets - even then it was slow to start. 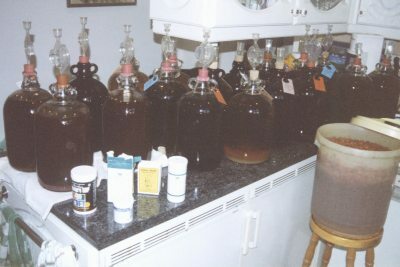 The 2003 batch was two gallons and started life on the boat with us as did the 4 gallon batch in 2004. 3.5 Kilos Sugar boiled and added to the fruit and made up to 4.5 gallons with boiling water. Cooled and 8 (reduced in 2001) campden tablets and pectic enzyme added as the fruit had been heated. Strained after 5 days on pulp into 4 demijohns - the 8.5 kilos fruit had reduced down to under 2 kilos dry pulp. 500gms Sugar in solution added and a very lively fermentation at 1.022. Racked after about 10 weeks - the 2001 batch was crystal clear and under .990 gravity so a little extra sugar (0.4 kgs) in solution added when topping up to total of 1.3 kgs/demijohn) . This was made with Blackberries picked on the towpath and overhanging the canal in late August. They were frozen in the fridge on the boat in batches. The sugar and water was not hot enough to sterilise the fruit so Campden tablets were also used. We had no pectic enzyme otherwise it would have been used although the temperature had only reached about 50 degrees Centigrade. 1.7 Kilos Sugar boiled and added to the fruit and made up to just under 2 gallons with boiling water. Starter bottle of CWE Formula 67 yeast added after a day. Strained after 6 days on pulp into 2 demijohns with .7 Kilo Sugar in solution added. Another 0.4 kilo sugar in solution added after 7 days and topped up to near top of demijohn as fermentation had abated - we are aiming for a full bodied medium wine but the gravity after sugar was 1.055 a bit high at that time - it is better to add in smaller amounts as the gravity falls . The wine was racked after two months when the gravity was down to 0.995 and the wine was clear with a thick deposit. The wine was topped up with a boiled and cooled solution containing 200gms of sugar (total sugar 1.5 kgs/demijohn as we are aiming for a full bodied wine which does not want to be too dry). The end result is everything we hoped - not a wine to share! We have a large and often prolific Morello cherry tree shown on our wine label and we are looking for a staple wine. We are aiming at wine which is not bone dry to complement the flavour of the cherries. However as time has gone on the cherry tree has gone over the top or has some disease and has been less prolific, the fruit does not set and the ends of the branches wither and die when it is a dry year and the wine has become lighter in body and colour. The description below is for the 1998 wine but we repeated almost exactly with a 5 demijohn batch in 1999 - again it proved slow to complete the fermentation and I wonder if the fruit has more sugar itself than I realised. In 2000 I measured the gravity of the must and it was equivalent to another 200 gms sugar per demijohn - no wonder it is so strong and difficult to ferment to dry! I now start with 3 kgs sugar rather than 4 Kgs in a 4 demijohn batch and add in more stages. I now use only two or three campden tablets as the colour tends to disappear although it does return during fermentation once the effect has worn off. Racked when fermentation stopped, topped up with diluted sugar solution (4oz/pint) gravity a bit high still at 1.008 rather than 1.003-1.005 aimed for .... will it start to ferment again? Yes it did - fermenting very slowly as summer came. Racked in mid June after 9 months - looks very nice and clear. First gallon bottled in after 21 months - still medium but it had plenty of body and the taste of cherry to go with it. Crystal clear and deep red colour. A wine to repeat and repeat and repeat! We were given enough Damsons to make 2 gallons of wine and also have our own Damson tree which is just coming on stream so the 2011 batch is half and half those from Fiona and our own. The Damson are hard and the stones do not come out so easily so they have not been fully stoned - just squeezed and mushed from frozen as much as possible. Otherwise the method has been much the same as Cherry. 2 x 4 ice cream tubs (5 kgs) of frozen Damsons, washed in sodium met solution and hand crushed when thawed. 0.5 Kilo Sugar in solution added. 1.5 Kilos Sugar boiled and added to the fruit and made up to 2 gallons with boiling water. 660 grams sugar in solution added. No sign of extra fermentation when summer came and it looks very clear so racked again and the fermentation traps replaced by corks. It was almost drinkable at this time (8 months) but we will leave it in the demijohns in a cool place for another year at least before bottling. This is very typical of a mixed fruit wine made whilst clearing out old fruit etc from the freezer to make space for another years crop. It was made almost precisely by, what I regard as my standard method, so I have described it more fully than usual as a model to be followed. The total fruit is about my standard measure of one ex ice cream tub of frozen fruit per demijohn. Each tub of fruit was covered in a sterilising solution of 2 campden tablets in a litre of water when almost thawed for circa 5 minutes and the solution poured into the next tub. The fruit was then hand crushed and/or stoned. The wild plums were a mixture of bullaces and sloes picked in Guernsey and were too small and hard to stone so were just broken open and crushed by hand. When completed it was covered with sugar solution which had been boiled for 3 minutes and made up to about 4.5 litres for each demijohn with more boiling water. This leaves room for the foam and crust during fermentation in the "bucket". This is cooled overnight prior to adding 4-5 grams Pectolase and between a half and one campden tablet per demijohn being made. This removes any pectin and completes the sterilisation. Here it deviates slightly from the standard method as it started as a 3 demijohn batch but an extra tub of cherries covered in boiling sugar solution was added after it had been cooling overnight to give it a bit more colour and flavour and make it up to a four demijohn batch. The elderberries were also added for colour and a little "bite" and in their case they were boiled with a little water until they dimpled and only the juice was used after sieving and a further short boil - elderberries can add all sorts of undesirable life and need to be well sterilised. The Must stood with Pectolase for a day and a starter was prepared and then "multiplied" by doubling the volume with Must repeatedly until there was 3 litres fermenting. I use Formulae 67 yeast which has added nutrients and a small amount of Bentonite (a clay based fining agent) at the rate recommended for starting a gallon (5 grams per demijohn) so the finning and nutrient is at the correct level rather than using the same starter regardless of batch size as they recommend. The initial starter has 5-10 grams sugar plus the yeast in 250 ccs boiled water cooled to circa 35 deg C. Each "doubling" takes between half and one hour to start vigorous fermentation ready for the next doubling. Even with this doubling the wine can be very slow to restart after doublings if a whole campden tablet is used per demijohn and I nw tend to reduce this to half. In this case my standard of approximately half the intended sugar was in the must but the fermentation was so vigorous that checks showed the gravity was down to zero after 4 days. I like to ferment on the fruit for 5 - 6 days to extract flavour and colour. An additional 500 grams of sugar was added to keep it going. By day five the pulp was very soft as the fruit had now been completely broken down by the enzyme and yeast so it was strained through a nylon straining bag which was then squeezed until the pulp was dry and crumbly - even with the stones it only weighed two kilos. The sugar was added in stages in a very typical manner and timing, initially to the intended 1,400 grams per demijohn (for 15% medium dry wine) and then an extra 50 grams per demijohn added to keep it in the dry/medium dry range of 1.000 to 1.005. This point took 3 weeks from fermentation starting. All the fruit hand crushed and the Cherries and plums stoned. The elderberries boiled in a little water until dimpled and the juice strained off and added to the must. 2 Kilos Sugar boiled and added to the fruit and made up to 4 gallons with boiling water. a starter bottle of CWE Formula 67 yeast progressively multiplied and added after another 24 hours. Strained after 5 days fermenting on pulp into 4 demijohns and 1.5 kgrams sugar in solution added. 200 grams sugar in boiled solution added when gravity fell to 0.098 (took 7 days) - level now just below neck of demijohn. Racked off lees after another 11 days (5 weeks from starting) and topped up with boiled water - very firm sediment and hardly any losses. Racked and sealed for storage after one year - sometimes an intermediate racking is required if a lot of sediment is thrown. First bottling after 3 years. This is another example of a mixed wine made by the standard method so only the basic ingredients will be given. All the fruit hand crushed and the Cherries stoned. This was an experiment as I had a litre of red grapes from a friend. I did not have enough to make a grape only wine so I added them to the pulp from the mixed wine above after I had strained off the wine and added 4 litres of water and 500gm sugar and fermented for another 4 days before straining off. I expected a light rose colour but it has turned out to be a true red with quite a different flavour to the mixed fruit wine it was based on. Bottled in 2011, light and a slightly unusual taste which I have had before from frozen grapes from the same source - drinkable but avoid the grapes in the future. This is based on a wine made in 1997 made from Victoria Plums, Morello Cherries and Blackberries (2:1:1 ratio). The name came about because it was a mix of stoned fruit and berries. 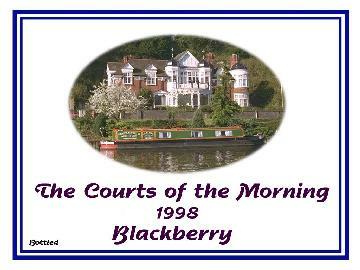 The original 1997 Stoneberry was very successful but made before documentation on the web site was started. My written notes show I used the same methods I now use (frozen fruit stoned/crushed, sterilised with NaMet and then boiling sugar solution poured over it) and a few "improvements" have been made based on our other experiences with plum wines such as the Plum+ described earlier. The aim is for a slightly cleaner and more full bodied wine than the 1997. In 2002 the fruit was hand crushed and/or stoned after freezing and thawing. This time the plums were also skinned to reduce the tannin and improve the flavour - the skins mostly just fell off after freezing. A banana was added to increase body which plums lack and a small number of blackcurrants were added to give more colour and a touch of flavour which again the plums lack, especially when skinned. We had a bottle on New Years eve of 2006 and it was excellent and probably close to reaching its peak. The 2003 was very similar except that the banana was omitted and a small number of loganberries were added to give body and bouquet. All the fruit hand was crushed and the Cherries and Plums stoned. The plums were mostly skinned to reduce the tannin and improve the flavour. 1 Kilos Sugar boiled, cooled and added to the fermentation after 3 days as it was down to 1.000 gravity. 500 grams sugar added when gravity fell to 0.992 and fermentation slowed (11 days from starting) - level now at neck of DJ and SG 1.000. Racked off lees after another 11 days (5 weeks from starting) and 800 grams sugar in boiled solution added - very firm sediment and hardly any losses.